It is now 20 years since states signed onto the 1992 United Nations framework convention on climate change, and global greenhouse gas emissions are rising faster than ever. ​​The conclusion has to be that unless today's governments and government leaders are held accountable for what the evidence shows is at least the grossest criminal negligence ever, there will be no action taken to reverse global greenhouse gas emissions which will be the end of civilisation and humanity because it will be the end of agriculture in the world. The planet will be transformed into one no longer sustains agriculture. ​​At today's global warming of 0.8° C research has found that there is a discernible loss in crop productivity attributable to global climate change in most of the world's regions. ​​The IPCC climate crop models project that for minimal levels of global warming food productivity in the most climate change vulnerable regions of the world, where coincidentally the most socio economically deprived and climate change innocent populations of the world live, crop production will decline below today's yields. These most vulnerable populations number in the billions. It is impossible today to avoid a global temperature increase of 3° C because of the inertia of the climate system​​. At 3° C the assessments project that all crops in all regions will have declined below today's baseline yields, with crops in the most vulnerable regions declining up to 30%. ​​Because world states have by done nothing over the past 20 years to to prevent this situation arising, this already committed food security catastrophic situation condemns the lives of billions of people in the forthcoming decades. With these states over the past five years of continuous negotiations to implement their clear obligations under the terms of the 1992 United Nations Framework Convention on Climate Change (let alone the obligations humanity) all of us living in all regions are condemned to suffer significant losses of food. There is no food security in the world any longer because of committed future global warming climate change (which is a definite that the climate change science) and no international agreement to reverse the still escalating global greenhouse gas emissions. ​​Climate Interactive using climate change rejecting models has calculated that if all the national pledges that have individually be made formally to the United Nations climate change secretariat were all carried out, that they commit the world to a global warming of over 4° C by 2100. 4° C is an total food catastrophe with most of the land in the world rendered incapable of supporting agriculture. 4° C global warming, according to the published science, could happen as early as 2060 on the present global greenhouse gas emissions track. ​​Obviously this situation is the worst ever crime against humanity, but the situation is far worse even this even. ​​Incredibly the 2007 IPCC assessment on the most important of all global climate change impacts - food security, assessed that there was no problem ! ​​How can these scientists and policy makers who make up the Intergovernmental Panel on Climate Change say that with another 70 years of unmitigated* global climate change there will be 442 to 720 million less hungry people in the world ! The marginal increase in the number of people at risk of hunger due to climate change must be viewed within the overall at reductions due to socio economic development.​​ Compared to 820 million undernourished today scenarios with climate change project 100 to 380 million undernourished by 2080 IPCC 2007. This of course is dead wrong and the IPCC to counter this estimate excludes all the evidence, that is included in the climate change food economic assessment below, that disagrees with this ridiculously optimistic assessment. The magnitude of these climate impacts will be small compared with the impacts of socio-economic development. With reference to Table 5.6, these studies suggest that economic growth and slowing population growth projected for the 21st century will, globally, significantly reduce the number of people at risk of hunger in 2080 from current levels. Specifically, compared with FAO estimates of 820 million undernourished in developing countries today, .. reductions by more than 75% by 2080, or by about 560-700 million people, thus projecting a global total of 100-240 million undernourished by 2080 (A1, B1 and B2). These projections also indicate that, with or without climate change, Millennium Development Goals (MDGs) of halving the proportion of people at risk of hunger by 2015 may not be realised until 2020-2030. 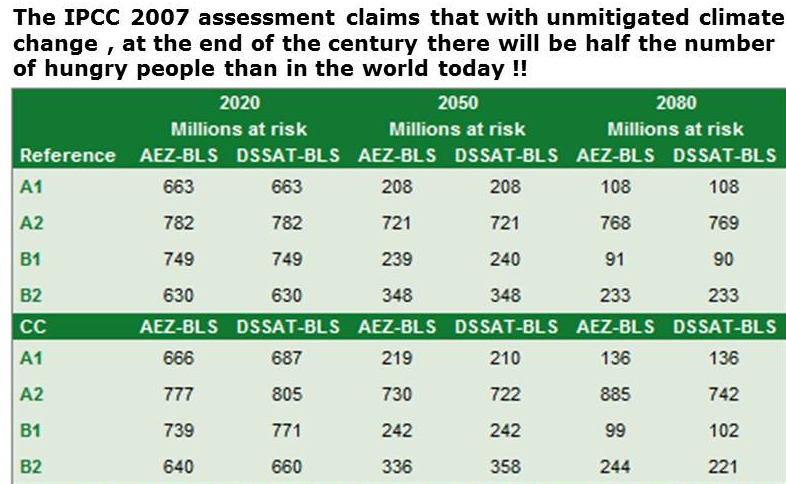 For instance, projected absolute global numbers of undernourished in 2080 in the range of 120-380 million people across SRES scenarios A1, B1 and B2, as opposed to a range of 100-240 million when account is taken of CO2 effects. The exception again in these studies is SRES A2, under which scenario the assumption of no CO2 fertilisation results in a projected range of 950-1,300 million people undernourished in 2080, compared with 740-850 million with climate change and CO2 effects on crops. Recent research suggests large positive effects of climate mitigation on the agricultural sector, although benefits, in terms of avoided impacts, may be realised only in the second half of this century due to the inertia of global mean temperature and the easing of positive effects of elevated CO2 in the mitigated scenarios. Even in the presence of robust global long-term benefits, regional and temporal patterns of winners and losers are highly uncertain and critically dependent on GCM (climate change) projections. ​ reference projections under SRES scenarios and no climate change. ​of elevated CO2 on crops. ​ according to FAO data. ​Underestimating climate crop models and unreliable economic models. IPCC 07. ​​Remember that the climate crop models on which these projected changes in crop yields are based by the IPCC fail to capture about half of the multiple adverse effects of global warming and climate change on crop production. but the IPCC totally overlooks this fact in estimating how many people will go hungry, starve and die, as a result of global climate change. A number of studies have quantified the impacts of climate change on food security at regional and global scales (e.g., Fischer et al., 2002b, 2005b; Parry et al., 2004, 2005; Tubiello and Fischer, 2006). These projections are based on complex modelling frameworks that integrate the outputs of GCMs, agro-ecological zone data and/or dynamic crop models, and socio-economic models. In these systems, impacts of climate change on agronomic production potentials are first computed; then consequences for food supply, demand and consumption at regional to global levels are computed, taking into account different socio-economic futures (typically SRES scenarios). A number of limitations, however, make these model projections highly uncertain. First, these estimates are limited to the impacts of climate change mainly on food availability; they do not cover potential changes in the stability of food supplies, for instance, in the face of changes to climate and/or socio-economic variability. Second, projections are based on a limited number of crop models, and only one economic model (see legend in Table 5.6), the latter lacking sufficient evaluation against observations, and thus in need of further improvements.